The tarot is a pack of cards. Tarot decks usually have 78 cards in total: 21 trumps, 40 pips, 16 face cards, and one Fool card. In England and the United States, tarot cards are used for divination. In many European countries, the cards are also used in games. ---> Download the Tarot in various formats (PDF, Epub, Kindle) for reading and sharing. The pack which English-speakers call by the French name tarot is called tarocco in Italian, Tarock in German and various similar words in other languages. Tarot games spread to most parts of Europe, notable exceptions being the British Isles, the Iberian peninsula, and the Balkans. Contrary to popular belief, Tarot cards did not precede ordinary playing cards, and they were invented not for the occult but for purely gaming purposes. Only later were they used for cartomancy and divination, and also as a field for artists to display specific iconographies, often connected to some ideological system. Concrete forms appear at least since the article of Court de Gebelin in the year 1781. Play is typically counter-clockwise; the player to the right of the dealer plays to the first trick. The players must follow suit if they have the card of the suit led, otherwise either trumps or a card from another suit is played. The winner of each trick then leads to the next. Tarot reading revolves around the belief that the cards can be used to gain insight into the past, current and possible future situations of the subject (or querent), i.e. cartomancy. Some believe they are guided by a spiritual force, while others believe the cards help them tap into a collective unconscious or their own creative, brainstorming subconscious. The divinatory meanings of the cards commonly used today are derived mostly from cartomancer Jean-Baptiste Alliette who was also known as Etteilla. The original purpose of tarot cards was for playing games, with the first basic rules appearing in the manuscript of Martiano da Tortona before 1425. Tarot cards would later become associated with mysticism and magic. Tarot was not known to be adopted by mystics, occultists and secret societies until the 18th and 19th centuries. The earliest known use of tarot cards for divination was in Bologna Italy, around 1750, using a set of divinatory meanings entirely different from modern divinatory tarot. Modern occult tarot begins in 1781, when Antoine Court de Gébelin, a Swiss clergyman and Freemason, published Le Monde Primitif, a speculative study which included religious symbolism and its survivals in the modern world. De Gébelin first asserted that symbolism of the Tarot de Marseille represented the mysteries of Isis and Thoth. Gébelin further claimed that the name "tarot" came from the Egyptian words tar, meaning "royal", and ro, meaning "road", and that the Tarot therefore represented a "royal road" to wisdom. De Gébelin also asserted that the Romani people (Gypsies), who were among the first to use cards for divination, were descendants of the ancient Egyptians and had introduced the cards to Europe. De Gébelin wrote this treatise before Jean-François Champollion had deciphered Egyptian hieroglyphs, or indeed before the Rosetta Stone had been discovered, and later Egyptologists found nothing in the Egyptian language to support de Gébelin's fanciful etymologies. Despite this, the identification of the Tarot cards with the Egyptian "Book of Thoth" was already firmly established in occult practice and continues in modern urban legend to the present day. The idea of the cards as a mystical key was further developed by Eliphas Lévi and passed to the English-speaking world by The Hermetic Order of the Golden Dawn. Lévi, not Etteilla, is considered by some to be the true founder of most contemporary schools of Tarot; his 1854 Dogme et Rituel de la Haute Magie (English title: Transcendental Magic) introduced an interpretation of the cards which related them to Hermetic Qabalah. 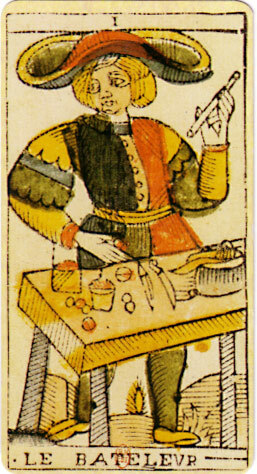 While Lévi accepted Court de Gébelin's claims about an Egyptian origin of the deck symbols, he rejected Etteilla's innovations and his altered deck, and devised instead a system which related the Tarot, especially the Tarot de Marseille, to the Hermetic Qabalah and the four elements of alchemy. Tarot divination became increasingly popular in the New World from 1910, with the publication of the Rider-Waite-Smith Tarot in December 1909, (designed and executed by two members of the Golden Dawn), which replaced the traditionally simple pip cards with images of symbolic scenes. This deck also further obscured the Christian allegories of the Tarot de Marseilles and of Eliphas Levi's decks by changing some attributions (for instance changing "The Pope" to "The Hierophant" and "The Popess" to "The High Priestess". The Rider-Waite-Smith deck still remains extremely popular in the English-speaking world. Tarot cards can be used as a psychoanalytical tool. Generate numbers from 1 to 78 and refer to that card in the list. Always interpret the Tarot honestly. The following examples are based on the Rider-Waite tarot deck. Feel free to print out this page, write the numbers 1-78 on little pieces of paper, and play it with friends. 1. The Fool strolls relaxed and carefree through life. The figure is androgynous, symbolizing both masculine and feminine attributes. He is a free mystic, wise and boundless. The Fool follows the path of inner happiness and universal love rather than seeking wordly wealth. From the perspective of others, he is a fool indeed. He hauls a wand over his right shoulder. A bag, containing his past experiences and meager possessions, is tied to the wand. He walks relaxed but with self-discipline. In his left hand he holds a white rose. It symbolizes his love for God, his spiritual goal. A small white dog is with him. The Fool has some companions along the way into the light. The path of the Fool leads through the mountains of enlightenment. The sun is shining. Nature seems to guard him and care for him. The fool is led by his inner voice and his good karma. Example meanings: Live today primarily from the pleasure principle. Feel just your physical and spiritual needs. Follow spontaneous impulse. Be yourself. Live yourself. What do you want now? What do you need now? Enjoy being. Receive the day's beauty. Standing in the Germanic rune: Changing affliction into accepting. 2. The highest art of magic is to conjure from the five elements earth, fire, water, air and ether (space) the Philosopher's stone. With the philosopher's stone, you can turn iron (a stressed soul) into gold (an enlightened soul). For the right recipe for the production of gold in the Middle Ages many people were looking for. They all failed because they did not understand that the doctrine of the five elements is a psychological method. Gold in the alchemy is a state of consciousness that means inner happiness. The inner happiness can be achieved if we consistently exercise the five qualities earth (joy), fire (self-discipline), water (a good feeling for the right way), air (ego resolution, taking things as they are, flowing positive with the wind of life) and love (unity consciousness, ether). For this, the magician (Master of the five elements) has on his table a coin (earth), a rod (fire), a chalice (water) and a sword (air). The fifth element is symbolized by the decoration of the room with red roses (love) and white lilies (purity). The magician raises his wand in the air. He has the power to win. He is the Master of the five elements. He will get the inner happiness (enlightenment). He sacrifices his ego by putting his left hand to the ground. He thinks his magic spell (a mantra, a positive word, the oracle sentences). And turns into a golden Enlightened (King of the Coins). Above his head is a halo of a horizontal eight, the infinity sign, that means eternal life in the light. The posture of the magician shows the Germanic rune: Sacrificing the ego. A vertical line (standing man) that is crossed diagonally (arms). Oracle = You are a Master of life. You win through the five elements. Live in the right moment and in the right amount the five qualities peace, wisdom, love, joy and self-discipline. Sacrifice your ego. Take your situation as it is. Let your false wishes go. Concentrate on your spiritual path (inner happiness, enlightenment, God). Live healthy and happy. Have some fun. Love all. Do good. Forward with wisdom and self-discipline . Success. 3. The High Priestess (Mistress) sits in a blue dress (inner peace) in the temple of wisdom (enlightenment) on a throne. To her right is a black and on the left a white pillar (the left and the right Kundalini channel is activated). She holds in her lap a holy book (Bible). She is centered in her spirituality. On her heart chakra we see a christian cross. She has overcome her ego and lives in God (in the light of enlightenment, the higher consciousness). Behind the High Priestess is a beautiful curtain of palms and pomegranates. The palm trees and apples indicate victory and happiness. The High Priestess will triumph in her life because she consistently goes her way of inner happiness and universal love. At her feet we find a crescent moon. The moon is a symbol of the path of peace. The High Priestess lives in calmness and acts out of her inner peace, her intuition and her love. Oracle = Live as a wise woman or wise man. Go the way of wisdom. In the outer life there is a constant changing of sorrow and joy. Nothing is permanent. Anchor yourself in your inner happiness. Consistently go your spiritual path. Make each day your spiritual practices (yoga, reading, praying, meditating). The most important exercise of the wise woman is the daily reading in a spiritual book (oracle). As a result, she never loses her wisdom and will after all external crises always return to her spiritual path. Follow your clear head and your inner sense (intuition). "My way of wisdom is ... Unwisdom is ...). Forward. Success. 4. Day of Blessing. The sky is full of light. From a forest, a river brings good energy. A grain field with ripe ears of corn indicates great harvest. Amidst the grain field sits the Goddess (Empress, Great Mother, Freya, Demeter, Mahadevi) in a white dress full of painted roses (purity and love) and a crown of stars on her head (cosmic consciousness). To her right is a large heart with the Venus sign (love). The left hand is relaxed on her knee. The Goddess of Love is well grounded. She rests in herself and in her inner happiness. In her raised right hand she holds a scepter with a crystal ball on it. The ball is a symbol of life in the light (in God). The Goddess (Empress) is enlightened. The light of God shines through her to the world. The Goddess gives her light to her fellow man. She sees herself primarily as a mother of all beings. The Goddess sits comfortably on a large sofa. She acts out of living in rest, being and happiness. Who goes the way of love based in his own peace and happiness, does not use up his energy. His energy, love and happiness is growing more and more. Oracle = Go the path of love. Who lives in all-embracing love und does good to all, harvests a good karma (fate). What is the abundance in your life? What can you give to make your fellow people happy? Give you enough breaks. Don´t exhaust your energy. Live in the balance of rest und acting. Give centered in your own happiness. Think the mantra, "I send light to (name). May all people be happy. May the word be happy." What is your deed of love today? Success. 5. In a desert a king with a white beard sits on a throne. Under his red cape, he wears a suit of armor. This points to his iron will. He is a master of himself. He has the ability of self-discipline. In his left hand the king holds a ball. The ball represents the spiritual goal of a life in the light (in God, in a unity consciousness). The king strives for enlightenment. He wants to realize his inner happiness. He can achieve his goal, if he does his spiritual exercise constantly and with self-discipline. Behind the throne, we see a blue river flowing. The king must awaken his Kundalini energy. When the energy in him begins to flow, the king will become happy. In his right hand the king holds an (Egyptian) cross. At the corners of the throne are four rams' heads. The king has to sacrifice his ego. He has to take things as they are. In the moment he lives in a desert, in the desert of unhappiness. The way to happiness is to take his situation as it is and to go with self-discipline his way of wisdom and love. The iron king symbolizes the strong God Father (Moses in the desert, the Yoga-God Shiva, the German God of War Odin, the Greek God Zeus). With wisdom, power and self-discipline he rules his land, his people and over himself. What goal he takes, he achieves it. Oracle = Bring yourself with your spiritual practices into the light. Your way goes through a difficult phase. Listen carefully to the wise king in you. Take things as they are. Let your false wishes go. Live according to a clear schedule. Achieve your goals with self-discipline. "My goals are ... My way to reach my goals is ..." Forward. Success. 6. In the temple of God, sits the spiritual Master (Hierophant, High Priest) in a red robe with a golden crown on his head. Two keys lie under his feet in the form of a cross (ego sacrificing). The Master has the spiritual knowledge to open the temple of inner happiness (how to awaken the Kundalini energy). He knows what to do and what to let go of on the path of enlightenment. He can give every person the spiritual practices that personally are effective for him. Besides the two keys are two spiritual students (monks, yogis). One student has a red robe with roses. The other student wears a blue cape with white lilies on it. One student must live primary as a helper of all beings to awaken his enlightenment energy. The other student must primarily do his spiritual exercises (yoga, walking, reading, meditation, mental work) to attain enlightenment. The Master holds up the triple cross of wisdom, love and self-discipline in his left hand and swears with his right hand by God always to tell the truth. He sits between two pillars in the temple of God. He lives in the light (cosmic unity conciousness). His left and right Kundalini channel is activated. When energy is in the left and right side of the body, automatically starts the main energy in the middle channel to flow from the feet up to the head. This is represented here by a golden crown as a symbol of the activated crown chakra and also by the white stripe in the middle of his shell (body). The Master ist enlightened and therefor has the possibility to bless us with true spiritual knowledge and energy. Oracle = Your life is blessed. You will win on your spiritual path. Listen consistently to the voice of your inner truth. Find the right daily exercises for you. Live as a spiritual Master. Master your life. Help your fellow men on their way. Follow the path of your wisdom and love. Think the mantra, "Om all enlightened Masters. Om inner wisdom. Please guide and help me on my way." Forward. Success. 7. The Lovers. A man and a woman (Adam and Eve) walk together the path of enlightenment. Behind everyone of them grows a tree. Everyone has his own personal path. The enlightment tree (tree of paradise) is a symbol of the Kundalini energy (the Kundalini channel in the middle of the body). Around Eve's tree (tree of knowledge of good and evil) winds a snake. The snake is a symbol of wisdom. The woman has a good contact to her inner voice (her feelings). Adam's tree (tree of eternal life in the light), however, is slightly larger. The man has more power and self-discipline. To get enlightenment (a life in the light) we need the quality of wisdom and the quality of self-discipline. We need love and strength. If the male and the female aspects in us work good together, we can reach our goal and stay permanently in the light. In the middle between Adam and Eve, rises the mountain of enlightenment. Over the hill appears God in a cloud. Above him shines a large sun. The sun symbolizes the energy of God (the light). God lives in the light and blesses us with light (with spiritual success). He spreads his hands over us and guides us on our way. God has great wings in the Tarot card. He can be seen as a Guardian Angel. In any case expresses the card that we are protected by higher powers. We are protected as a single person or as a couple. The card can also mean that a relationship succeeds. Oracle = You are protected. You can go your way with confidence. God (the enlightened Masters, the Guardian Angel) is with you. Follow your inner voice of truth and love. Go consistenly your personal way of rightness (wisdom). Then you will conquer. "The right way is ... Not right is ..." Forward with optimism. Success. 8. The Chariot reaches its goal of enlightenment (healing, happiness) by doing nothing (living in rest, wu wei). It is pulled by two seated sphinxes. One of the sphinxes is black and the other white. White is the color of purification (doing exercises) and black symbolizes the path of rest. Rest and spiritual practices are the way to healing and holiness. In the chariot, a man stands with a crown of stars on his head (cosmic consciousness). He wants to come to enlightenment. Behind him is a blue curtain with many bright stars. He wants to live in being, in God and in happiness. The secret of enlightenment is to live in enough rest so that the energy of a person turns inward. Normally a person uses up his energy in outer activities. At a certain point of rest, the energy turns inwardly and resolves all tensions. Whoever finds this point of calm and consistently lives in it, grows to enlightenment, healing and happiness. He comes into a life in the light. The body heals the tensions nearly by its own. We have only to do also some spiritual practices for our body and our mind. We can do some yoga, meditation, going, reading and mental work (positive thinking). We have to feel what we need and what brings us to inner healing and happiness. Oracle = You need plenty of rest. Live today as a Buddha (Sphinx) of Rest. Let all external goals go of. Avoid hyperactivity. Relax. What is your way of rest now? What spiritual exercises do you need? Get to inner peace. Enjoy your life. Bring so much joy in your day that you feel well in your life. 9. Strength. We see a dry desert, at the horizon a blue mountain, and in the foreground a white woman who tames a lion. The lion is a part of her inner self. The woman is fighting with herself. In her fight her spiritual wishes (inner happiness, enlightenment, living in God) with her wordly desires (career, relationship, consumption, outer wealth). The woman will win. She has a flower crown on her head. The sky is yellow. Optimism. The name of the card is strength. Forward with strength. The woman is struggling hard. With wisdom and inner strength the woman solves her problems. She thinks carefully about her situation, her goals and her way. She makes a clear decision and walks her path of wisdom consistently. She closes the lion's mouth. The lion cannot eat the goddes. She controls the animal in her. Step by step she succeeds on her way (to the blue mountain of enlightenment). Step by step she realizes the goddess in her. Above her head is a horizontal eight, a symbol of the eternal life in the light. Oracle = Wisdom is to distinguish the essential from the inessential. Wisdom is to make health, happiness and all-embracing love to the center of your life. What are your goals? In what way can you achieve your goals? Educate your thoughts and you'll grow into happiness. "Wisdom is ... Unwisdom is ..." Forward with self-discipline and fortitude. Success. 10. A hermit in a gray cloak stands on a snowcapped mountain with a lantern in his right hand and a long staff in his left hand. Around him is only the blue sky. The man symbolizes a yogi who lives and practices separated from his fellow men. His lantern shines a bright light. The lantern is a term for the interior of the yogi. The inner light enlightens him, shows him his way of practicing and enlightens also the world around him. Because of the inner light, he can live happy in his seclusion. His body forms the position of the Is-Rune. The old german word "is" means ice and symbolizes the technique of meditation. In meditation the mind becomes quiet. It is like frozen ice. The hermit practices meditation in sitting, standing, going and lying. This is the original buddhist way to enlightenment. Living in secluded rest, meditating and working on the mind (finding thoughts of peace, love and wisdom) is the fastes path to inner peace and happiness. Oracle = You need a lot of rest to find yourself and to develop your inner happiness. Success on the path of seclusion, rest and spiritual practice (yoga, walking, meditation, reading, positive thinking). If you are in a relationship or together with other people (a group), find every day some time for yourself. Make some spiritual exercises. Come to rest and inner peace, until the happiness awakes in yourself. Then you can live in giving. This is the best way to lasting happiness in a relationship. If you are a single, use the opportunity to fast spiritual growth. Those who live alone, may well develop their inner happiness. Enlightenment occurs through a lot of rest connected with enough spiritual practice. Most singles flee the silence and the resulting boredom. This boredom is only a transitional stage to enlightenment, when we combine it with spiritual exercises. Then there is no more loneliness, but only egolessness, unity consciousness, happiness, positivity and all-embracing love. 11. In the sky appears the wheel of Fortune. It is the signpost to a blessed life. Around the wheel are the symbols of the five elements. The lion represents the daily self-discipline in spiritual practice. The eagle can differentiate with his good eyes the essential from the inessential in life. The angel follows the path of all-embracing love. The bull is a sacrificial animal. If we sacrifice our ego, we come to enlightenment. The fifth element is the wheel itself. Its circular shape means cosmic consciousness (wholeness, oneness, the zen circle). On the wheel sits a blue Sphinx (Buddha) with a sword. The Sphinx has overcome her ego and awaken her enlightenment energy. Besides the wheel, we see a jackal (egyptian God of death Anubis, sacrificing the ego) and the Kundalini serpent (awaking the inner happiness). Oracle = After initial difficulties tends the day (your life) to a good end. Who sows good fortune will harvest a good destiny. Live wise and get a good karma. Organize your life as a way of fortune. Plan your life well. Become a happy Sphinx (Buddha, Holy, Goddess, Enlightened). Follow the goal of inner happiness and all-embracing love. Transform your life into a paradise. Be a wise eagle, a strong lion, an angel of love, an egoless bull, and a happy Sphinx (Master of Destiny). What is your way to a good destiny? "My goals are ... My path of a good destiny is ... " Success. 12. The Tarot card Justice means rightness. Go the right way in your life. Then you win. A King in a red coat sits in the temple of wisdom on a throne. In his right hand he holds a sword and in his left hand a scale. He looks exactly at the problem, thinks about it, weighs with good inner feeling all arguments, makes a clear decision and carries it out with power. So he comes into the light. Above the king shines a yellow sun. Who wants to live in the light, must consistently follow the path of truth, wisdom and rightness. The term justice comes from the Bible and means in today's language rightness. In the cosmos there are laws of happiness. Anyone who adheres to these laws grows in his happiness. Those who violate these laws will be punished. The laws of nature are inexorable. It is wise to recognize this and to walk in his life the way of wisdom. The king shows us his right foot. The foot is white. We should consistently go our path of wisdom. Oracle = Success on the way of your personal rightness. See your situation. What are your problems? What are your possibilities? What are your abilities? What solves your problem? What ist your road to a fullfilled, happy and healthy life? A person has two measuring instruments for a right decisions, the mind and feeling. He can think about a problem and he can feel how to solve it. It is optimal when the mind and the feelings come to the same decision. If we have to make an important decision, we should think so long about a problem until our mind and our feelings find together. Right acting brings a good fortune and wrong acting leads to suffering. This allows us to distinguish a good from a bad decison. We should collect all the information that we can get. We should ask the experts (books, science, internet). We should consider the impact of our actions to the future. Forward with clarity and wisdom. "My right path is .... Not right is ...." Succeed. 13. A man hangs upside down from a tree. His right foot is bound on the tree and with his left foot and his arms, he makes a yoga exercise. The man can not avoid his situation, but he can act internally. He can create happiness in his mind with his spiritual exercises (yoga, meditation, positiv thinking). He can activate his Kundalini energy. He can flow positively through the difficult situation. He has a halo around his head. An enlightened can overcome outer suffering through inner happiness. Spiritually the hanged man practices a reversal position, through which the Kundalini energy can be activated. In Yoga we have the candle and the headstand. In the legends of the ancient Germans is reported that the God Odin hung nine days upside down from a tree. Then his enlightenment energy awoke and he was able to free himself from his bad situation. Oracle = You go through a difficult situation. Sacrifice your ego and take things as they are. Think positiv. Make your spiritual exercises (yoga, walking, meditation, mantras, praying) and awake your Kundalini energy. Take the pain in your life with equanimity. Flow with serenity and inner happiness through all outer suffering. Concentrate on your positive goals. Transform yourself internally into the strong and happy God Odin (a Buddha, a Goddess, an Enlightened). Equanimity and optimism. Success. 14. The death appears on a white horse with a black flag in his hand. In the black flag we see a white rose. The white rose is a symbol of the love of God. With spiritual exercises (meditation, positiv thinking), we can succeed in our transformation (spiritual cleansing process). The land on our side is a dry desert and in the land of the other the sun is rising. We have to focus on our spiritual goal (a life in the light). Before the white horse, we see four figures. They represent four different attitudes towards our destiny. The king fights against the changing. He must suffer, because he can not let go of his ego. He cannot take things as they are. The bishop sacrifices his ego and so comes good through the difficult time. The woman in white dress is living her grief. She sacrifices her ego by mourning. The child trusts in God as a great father and great mother. Who connects himself every day with God (the enlightened Masters) is protected in all phases of change. He will awaken in the light. Oracle = Transformation. Big change. Something old stops and something new starts. Death of the ego. Take things as they are. Let your false wishes go. Those who sacrifices their ego and are connected with the enlightened Masters (God), can go optimistic and with trust through all times of change. Walk over the big river of transformation to the land of light. A good destiny awaits you. The current cut is painful. But the future will be good. "Om all enlightened Masters. Om inner wisdom. Please guide and help me on my way." Forward with self-discipline and optimism. Success. 15. An angel in a white dress stands with one foot in the water and the other on the earth. In the background we see our spiritual path leading up to the top of a mountain, where the sun is shining. To get inner happiness we have to resolve our tensions. If we exercise spiritually too little, we will not solve our tensions. But when we exercise too strict, we can get tensions by practicing. The angel holds in his hands two cups. He pours wine from the left into the right cup. Under the left cup, we see yellow lilies. Yellow is the color of joy. We must take the middle road with some self-discipline and some pleasure principle to succeed. On the chest is a triangle (love to God the Father, the Son and the Holy Spirit) and on his forehead an open brow chakra (intuition, inner voice of wisdom). The angel has around his head a golden laurel wreath. He is a winner. Oracle = Find the right balance in all things. Live in the balance of spiritual practice and enjoying life. Slow down your speed. Bring so much joy into your life, that you can walk your spiritual path positively. You win balanced in joy and strength. Today a lot of fun is allowed. Success on the middle path. 16. The devil sits on a stone in the black world of suffering. Under him are a woman and a man. Both are chained to the rock of the devil. The woman has fruit at the end of her tail. She is bound to the world of suffering through her attachment to external concerns (relationships, career, and worldly wealth). She always wants more and more. The tail of the man is burning. His problem is anger. He creates suffering through his aggressiveness. He cannot take things as they are, and he cannot live in peace with the world and himself. The Devil is not chained to the stone. He can move freely. He can free himself from his suffering. What must he do? The Devil is a symbol of the ego of man. The ego is based on attachment to riches and pleasure, on rejection of misery, and on negligence of inner happiness. If we focus on the development of inner happiness, we can come from Hell to Heaven. Example meanings: Free yourself from your darkness. Bring yourself with your spiritual practices into the light. What is the suffering in your life? What is your problem? How can you solve your problem? Live centered in yourself and exemplify generosity. Move one hand in blessing and think, "May all people be happy. May the world be happy." Reversed meanings: Ignorance of worldly matters. Dishonesty to oneself. Hiding from one's negative qualities. 17. A lightning strikes in a tower with a crown. The Tower are you. An inner or outer storm shakes you. Around the tower there is chaos. We see rain, gray storm clouds and a black sky. But the tower stands on a rock. You go stable through all the difficulties. Two figures flee head over heels. The man wears a crown. The woman has a red cape. The woman embodies the attachment to external things and the blue man the rejection of the given destiny (lack of humility). We have to overcome our ego and to take things as they are. We must let our false wishes go of. We have consitently to make our spiritual exercises (yoga, walking, meditating, positive thinking). Then our Kundalini energy begins to flow. Through the crown chakra cosmic energy flows into us and fills us with light. Therefore, we see a large crown on the tower. It does not fall off, but only shows the way of the cleaning power (Holy Spirit). The cleaning starts in the head (thought work) and then heals the whole body. Oracle = An internal or external crisis cleanse you spiritually. It brings you forward on your spiritual path. You grow by the difficulties into the light. A mental flash resolves tensions (energy blockages) and the Kundalini energy begins to flow. You stay in spite of the crisis firmly on your spiritual path. High praise. Stand up again. The difficulties have somewhat shaken you. Set your crown back on and be a king of your destiny. You are a jack. Bethink yourself on your spiritual path. Realize your life goals. What are your goals? What is your way of victory? Go forward on your path of truth, wisdom and rightness. Succeed with steadfastness and endurance. 18. A naked woman is kneeling at a source and cleans herself. She brings herself by her spiritual exercises to strength and happiness. With her right hand she pours water into a source (root chakra) and awakens her Kundalini energy. With her left hand she watered the tree of enlightenment and brings her Kundalini energy to rise up in her spine to her head. Then her spirit becomes happy. On the tree sits a small bird. It is the inner voice of the woman. It tells her the best way of exercising. The woman is in good touch with her inner wisdom. Above her a large yellow star is shining in the sky, surrounded circular by seven small white stars. This symbolizes the cosmic consciousness of an enlightened (living in God). Oracle = Forward with self-discipline along the path of purification (healing, happiness, enlightenment). Your life is under a lucky star. You will have success. Save yourself with your spiritual exercises. Bring yourself into the light. Follow your voice of wisdom. What exercises do you need now? Practice yoga, walking, reading, doing good and meditation. What is your deed of love today? Optimism. Success. 19. A little cancer walks a long way to the Moon (inner happiness, God, enlightenment). In the foreground we see a pond from which the cancer starts. Before him lies the long road into the light. The cancer must travel through a desert. He has to pass two towers, which stand at the entrance of the land of light (the left and right energy channel, activating the Kundalini energy). Behind the two towers we see the blue mountains of enlightenment with the moon in the sky. A dog and a wolf are howling at the moon. The cancer must transform himself from an animal into the moon goddess. He has to overcome his animal instincts and to put God (the inner happiness) into the center of his life. The moon is a symbol for a good intuition. The cancer follows his intuition (inner wisdom), and thus finds his way into the light. He has only little feet. He can only go forward with small steps. Drops of light fall upon the earth. The small cancer gets help from the moon goddess. Oracle = You are now only a small cancer. You have little strength, the situation is difficult and the road is long. But even small beings can win if the light is with them. God (the moon in the sky) is merciful to you. You will reach your goals. What is your way of success? Listen to your inner voice. Go forward with wisdom and perseverance. Accept yourself as you are. Go with a clever strategy by the day. Find your way creatively and sensitively. Forward with small steps. Success. 20. On a white horse is riding a naked child. Its arms are open to life. It trusts the future. It accepts the will of the cosmos. It takes all things as they are. It flows positively with his life. A large sun shines in the sky with a friendly face. The enlightened masters (God) protect and guide their child. Therefore, it can optimistically ride into his future. A red flag next to the sun indicates the victory of light. Sunflowers on the horizon say, that abundance, joy and happiness come to us. Oracle = Trust in life. Define your goals clearly. Go your way with patience. Everything will be fine. The light is with you. "My goals are ... My way is...." Forward with optimism. Success. 21. In the sky appears from a cloud an angel with a trombone. On the trombone is a flag with a red cross on a white background (ego sacrificing, mental cleaning). On earth, the dead rise from their graves. They stretch out the hands to the sky. It is the Day of Judgement. God powerfully awakens the dead to stand up and to go into the light. Oracle = Restart. End of repression. Reconciliation. New beginning. Hope. Wake up. Don´t stay in the darkness. Bethink yourself on your goals. Go your way powerfully. Save yourself with your spiritual exercises. What is your trombone today? What idea can awaken your spirits again? Be a spiritual lion. See you as a yoga tiger. Visualize yourself as a powerful Goddess. Be the angel with the trombon. Overcome your laziness. You are a fighter. What actually brings your life energy to flow again? Rub yourself with cold water. Turn on loud music. Do yoga exercises. Go for a walk. Forward with force. The power is with you. Success. 22. The World (cosmic consciousness). In a large laurel wreath dances a naked woman. In each hand she holds a wand. Around the victor's wreath we see an eagle, a lion, a bull and a man. The eagle stands for wisdom, the lion for strength, the bull for ego sacrificing and the man for love. The woman is a Mistress of the Five Elements. With the five qualities inner peace, wisdom, love, happiness and self-discipline she transforms her world into a paradise. The circle (laurel wreath) symbolizes the cosmos. The woman in the circle has a cosmic consciousness. Through her two wands (spiritual exercises), she can hold herself in an internal equilibrium and an enlightened consciousness. Her world is in order. Everything is right as it is. She is naked. She is free. She has given up her ego. She flows positively with her life. She lives in harmony with herself and her world. She is content with her life and can see her world as a paradise. Oracle = Be a Mistress of the Five Elements. Keep up yourself with your spiritual practices in internal equilibrium. Practise always in the right moment wisdom, peace, self-discipline, love and enjoyment. Then you will conquer. Live in calmness, do your spiritual exercises (yoga, meditation, walking, reading) and bring the love into the world (do good). Flow positively with your life. Go ahead with trust. Be content with yourself and your life. Everything is fine as it is. 23. God appears in the grey sky. Out of a white cloud a hand gives us a stick. God gives us the strength we need for our success. God is with us. The power is with us. The enlightened Masters strengthen us. Under the stick, we see a river, a green country and a white castle on a hill. The white castle is our goal. Our goal is to live in God, to live in the light, to be enlightened. White is the colour of purification. We have to purify us spiritually. We must do every day our spiritual exercises (yoga, walking, meditation, mental work). The river is the border between the material world and the world of light. We have to overcome our ego to get into the light. We have to live centered in spirituality (in God, in wisdom, in the principles of inner happiness). Lasting happiness is only possible if we make the wisdom (God, inner happiness) to the center of our life. We must be centered in rest (calmness), wisdom, love and self-discipline. Oracle = Live as a winner. You can do it. You have enough strength to win. God gives you today all the power, you need to get through your current difficult situation and to achieve your goals. Bethink on your power. Think your mantra of victory. What sentence gives you the power to succeed? "My word of victory is ... (I got the power. I will win)." Think your sentence as a mantra. Programm your mind to win. You'll achieve your goals. Forward with self-discipline and optimism. You will conquer your inner or outer enemies. The power is with you. Luck. Success. 24. Two of Wands. A conqueror stands on his castle wall, looking out into the wide world. Before him lies the sea. He is on the beginning of a journey. In his right hand he holds a world globe. He concentrates on his goal. The left hand stamps out a large staff on the ground. Behind him is a second rod. The conqueror activates with the two rods his kundalini energy and thereby gets the power for a successful journey. On the left side of the castle wall we see the image of a cross of red roses and white lilies. The red roses indicates the path of universal love and the white lilies the path of inner purification. The conqueror wants a happy world and is doing his part for this. At the same time he is also working on his own inner happiness. He makes his spiritual exercises and gets a cosmic consciousness (enlightenment). The essence of Christianity is the way of the twofold love, "Love God (spiritual exercises), and love your fellow man (doing good)." This is the best way of a happy and fulfilled life. Oracle = Get a fulfilled life. Live as a Bodhisattva (Karma Yogi). Work for a happy world. Don´t work for your ego, but for the happiness of all people. This is the fastest way into a cosmic consciousness (enlightenment, a life in God). There is one great danger on the Bodhisattva way. Don´t exhaust your energy but grow in your energy. Give you every day enough rest. Make every day enough exercises (sports, recreation, meditation, mental work). Awaken every day your inner power (Kundalini energy) with yoga, walking, visualising, praying (mantra) and meditation. Feel exactly what you need. Then you win internally and externally. Success. 25. Three of Wands. A merchant with a rod in his right hand is watching his three ships sailing on the yellow, shimmering sea. The sky is orange, representing optimism. The merchant has all his things in order; he simply needs to wait and see the result. Behind the merchant are two rods. The man lives in the right balance of rest and activity. He is wearing a dress made ​​of five colors. His red cape gives him strength. The green cloth means hope. Below that is a yellow cloth meaning joy. The sleeves of the hand holding the stick is blue. We can interpret blue as the color of loyalty. The man has established strength and values. A black sash with white dots indicates sadness and inner cleansing. Reaching a goal requires sacrifice of something. The man makes the necessary sacrifice for his successful path. Example meanings: Stability. Certainty. Everything is evolving from its own. It is only a matter of time until success occurs. What did you start? What success do you expect? The future will be good. Hopeful expectation. Optimism. Luck. Success. 26. Four of Wands. Four bars covered with a garland of flowers stand on a still blank square in front of a castle. In the background we can already see some people celebrate. Two women swing bouquets over the head. They move from the background of the card toward the fairground. But they are not yet arrived at their destination. The goal is the spiritual self-realization, enlightenment, living in God. This goal is indicated by the castle in the background. The two main routes into a life in God are the path of universal love (doing good) and the path of spiritual practice (meditation, mental work). The right woman is wearing a red cape. She goes the way of love. The left woman has a white dress and a blue cloak. She cleans herself through spiritual exercises (reading, praying, walking, meditation). The flower garland hangs over both women. We have to combine the path of love and of spiritual practice to grow optimally in the light. The background of the tarot card is orange. Optimism. The women walk successfully the way into the light. Oracle = Before Thanksgiving. Your actions will lead to a big success. Your efforts will bear good fruit. Great joy awaits you. Something good is coming towards you. You can be optimistic about the future. Jubilation. Celebrate the day. 27. Five of Wands. The sky is blue. Five young men tussle in the free nature with big sticks. The number five points to the theory of the five elements. We succeed with the five qualities wisdom, self-discipline, peace, love and some enjoyment. Oracle = Go ahead playfully. Live mainly from the inside out. Feel your inner spontaneous impulse. Who exactly lives himself, gets by this much inner strength and reaches his goal by the power of joy. Ask yourself, "What do I want now? What do I need now?" What is your way of living? Be creative. Have fun. Succeed with the pleasure principle. 28. Six of Wands. The sky is blue. A rider on a white horse is holding a lance with a victor's wreath. He wears a laurel wreath on his head. Around him ride five other fighters who acclaim him. The rider is a winner. He has worked hard for his success. Now he enjoys his success. He was victorious in his fight. He is satisfied with himself and his life. He has cleaned himself inside and realized his higher self (inner purity, the white horse). He fought for a better world and realized the cosmic consciousness (enlightenment, a life in God). To that refers the victor´s wreath in the form of a circle. Oracle = The winner. You have won or you will win. Visualize yourself as a winner. Live as a winner. What are your goals? What is your way of victory? Think the mantra: "My goals are ... My way to win is ..." Although the situation is difficult and you hardly believe in your victory. Just go ahead with a clear winner will, a wise strategy, optimism and perseverance. At the end of the fight, the victory is waiting for you. You'll achieve your goals. The light is with you. Success. 29. Seven of Wands. A giant man stands with a large stick on a hill and knocks his enemies down. The man is strong and has a favorable position. He is stronger than his opponents. He has a green suit (hope, optimism). The sky is blue. That idicates inner peace and strength. Seven is a number of completion. But for this the man has to fight still some time. The man stands alone against a multitude, but he dominates the fight and will win. His opponents are smaller then he. We only see their six rods. Oracle = You have to struggle a bit. But you are strong and your position is favorable. Do not let yourself overcome by your internal and external problems (enemies). Forward with strength and endurance. You will win. "My enemies are ... My way to win is ..." Optimism. Success. 30. Eight of Wands. Eight arrows fly through the blue sky into the land of light. The land of light is our goal. The land of light is inside and outside. Outside we can work for a happy world, outer wealth and a good life. We can transform our world into a paradise. Inside we can develope happiness, enlightenment and a life in God. We can transform our mind into a paradies view of life. Eight is a numer of harmony and positivity. Under the eight arrows, we see a great river. To pass the river, we have to overcome our ego. We must purify our inner self with our spiritual exercises to get into a paradies feeling of life. In the green land of light on the other side of the river we see on a hill a white castle. This white castle is our enlightened self. The goal is near, but the big river is not yet crossed. Oracle = You have to work hard, but you will reach your goal. You succeed, if you concentrate on your goal. Think at your goal. Motivate yourself with your goal. See the benefits which you get when you reach your goal. Forward with all your power. Cross the great river. Overcome your ego. "My goal is ... My way of victory is ..." Success. 31. Nine of Wands. A fighter stands with his spear on a gray road. He looks skeptical about the future. On his head he wears a white bandage. His clothing is torn on his right shoulder. He has a hard fight behind him. But the battle continues. The fighter has already his sleeves rolled up. Behind him are lined up like a garden fence, eight rods. The fighter has a strong backing in God (in himself, his wisdom and his strength). Behind the fence we see under a blue sky, a green country. The fighter is defending his land (his place, his position, his people). The land is slightly undulating. His task is moderate to handle. Oracle = Bethink yourself on your strength. You are struck something. See you strong today. You are a giant, a strong man, a powerful woman. You are the Germanic God Thor, the God of Thunder. You are the powerful Goddes Freya. You have enough power to go on your way to success. Your task is to deal with. Forward with self-discipline and endurance. The light is with you. Success. 32. Ten of Wands. The sky is blue. A strong man brings ten large bars to his house. The man is dressed in green, the way is green and the house is green. Green is the color of hope. The man will do his job. But he carries heavy on the bars. His way is not easy. The man has to spend a lot of force to achieve his goal. Ten is the number of completion. On the horizon we see green trees, fertile fields and some houses. The man is building a happy world. Oracle = The road is hard, but you have enough power to reach your goals. You have to work hard for your success. Enlightenment is hard mental work. A happy world is not easy to do. Forward with self-discipline and endurance. Optimism. Success. 33. Page of Wands. A young man looks at his wand. He is a student. He has to find his goals of life. He has to find out who he is and what his task is. On the horizon to the right we see three mountains. The mountains (of enlightenment) are the goal of the man. Three is a number of action and energy. First, find your goals. And second, go on with power and self-discipline. The sky is blue. On his head the young man wears a white hat (internal cleansing) with a red feather (power). He has a yellow robe with black salamanders. The salamanders are animals of the fire element. Oracle = A new beginning. Think about your life. Reflect your goals. Find the best way to go forward. Awaken your Kundalini energy with your spiritual exercises (yoga, walking, visualization, mantra, meditation). "My goals are ... My path is ..." Forward. Reach your goals. You can do it. The power is with you. Optimism. Success. 34. Knight of Wands. A knight in armor of iron gallops on a brown horse with a lance in his hand through a desert to three pyramides in the left background. The pyramids are his goal (peace, love and happiness). His journey goes through the desert of renunciation. The knight has to renounce of some external things, so that he can achieve his goal of inner happiness (enlightenment, a life in God). He must overcome his inertia and go with power his way of wisdom. Then he will achieve his goals. The knight wears on his helmet a red plume. The robe over his armor is yellow and full of circular salamanders (small dragons). He will overcome his ego and jump into the light. Oracle = Full speed ahead. The situation is difficult. You're a bit tired on your way. Be a knight, a spiritual hero, a winner. Look at your goals and go your way with power. What are your goals? What is your path? " My goals are ... My way to succeed is ..." Forward with courage, power and optimism. Success. 35. Queen of Wands. She sits on a throne, dressed in yellow and blue. She holds a sunflower and a wand. A crown rests on her head, and it signifies wisdom. The arms of the throne are lions, and red lion-shapes decorate the tall back. With clear vision and willpower, the Queen of Wands leads her people into a golden age. A black cat sits at her feet, signifying freedom from the ego. She takes things as they are, and is subordinate to the will of God and the cosmos. Oracle = A person who accepts the situation, and continues from there. A person who works for a world of love, peace, and happiness. Watch the world put itself into order. Be a strong mother. The power is with you. Forward with wisdom, love, and power. 36. King of Wands. The king of wands sits on his throne with a golden crown (enlightened master), a red dress (good motivation) and green shoes (hope). In his right hand he holds a big wand. The power is with him. He rules successful his land. There are many difficulties in his country. The people need a strong king. Where self-discipline is necessary, he enforces it. Where lightness (joy) is possible, he admits it. In case of problems he always finds a solution. At his feet we see a little black lizard and on the back wall of his throne are lions. The king of wands is a beggar in God (egoless) and a Buddha (a lion) at the same time. This is the secret of his power. His power comes from God, from a consistent spiritual life (enough rest and enough exercises). Oracle = You're the boss. The power is with you. Success. You have all the power you need to fulfill your job. Rule your land (family, company, yourself). Live after a clear day plan of health and the inner power will always be with you. Put as many spiritual exercises in your day so that you always stay in strength and happiness. Do the five principles of health. Make every day endurance training (walking, jogging, cycling, yoga), eat healthy (lots of vitamins, low in calories, at least one apple a day), avoid harmful substances (smoking, alcohol, drugs, too much TV), relax enough ( breaks, meditation, sleep) and think positive (optimistic). 37. Ace of Coins. A hand appears in the sky from a cloud (God) and offers a golden coin. God offers you the way to peace, love and happiness (enlightenment). The coin contains an abstract drawing of a man (self-realization). Under the coin, we see a door in a tall hedge. The door is open. You only have to go your path into the land of light (the blue mountains in the background). Before the gate grow white lilies (inner cleansing) and in the hedge red roses (all-embracing love). The path of happiness consists of spiritual exercises (white lilies) and working for a happy world (red roses). Oracle = The life offers you a great opportunity. A door opens up. You have only to go the way. You must make a clear decision. Then God (your inner wisdom) will guide you on your way. You will reach your goal. Recognice that you own a great treasure. You got the knowledge of enlightenment. You got the knowledge to transform your word into a paradise. You got the knowledge to become a Buddha, a Goddess, a King of Coins. Go your way into the light. Decide yourself to be happy and to live a fulfilled life. "My way of wisdom is ... Unwisdom is ..." Use the favorable situation. Get the great treasure. Succeed. 38. Two of Coins. The sky is light-colored blue (things are not too difficult). On the path of life a man in a green dress and with green shoes dances with the ups and downs of his life. He wears red trousers, a red belt, a red skirt and a large red hat (love and wisdom). He's a good dancer. In his hands he juggles left and right a gold coin. The two coins are connected by a green band, which forms a horizontal eight. On the horizon we see big waves and two sailing ships. A ship passes up a wave and the other ship is flowing down. Life is an eternal up and down. A man of inner happiness dances wise with all events of life. Through his spiritual path, he stays in his inner balance. The two main spiritual techniques to get equilibrium (two gold coins) are regularly body exercises (yoga, meditation, walking) and mental exercises (self-reflexion, mind control, positive thinking). Oracle = Flow flexible with the outer chaos and keep your inner balance. A master of his mind lives permanently anchored in the light (God, enlightenment) and dances wisely with all outward situations. Live in rest and act out of the rest. When the body is quiet, you can more easily hold your mind quiet. Stop your negative thoughts and focus on positive thinking. Do every day something nice that opens your heart. Forward. Optimism. Success. "My positive thought is ... (I´m a master of life. I live as a winner. I am always optimistic.)" 39. Three of Coins. A sculptor is working in a church on an ornate column. The church is a symbol for God, for a life in the light, for the big goal of enlightenment (lasting happiness). The column stands for the path to reach this goal. To succeed, we need a good plan. On the right we see the creator in the green cape with a white scroll. Next to him stands the abbot of the monastery. We can look at him as our inner wisdom. At the top of the column are three coins. Our spiritual victory depends on a good plan, on a good contact to our inner wisdom and on a good self-discipline (the sculptor). Oracle = Succeed with a good plan. With a good plan of life you will receive a successful life. With a good plan of the day you get a successful day. First set your goals. With what strategy you are victorious? Go forward in your speed. Give you enough rest and spiritual exercises (yoga, walking, meditation), so that your energy lasts for the whole day. Get also some enjoyment. "My goal is ... My successful strategy is ...(I succeed with love to my goal, self-discipline, enough rest and a little bit pleasure)." 40. Four of Coins. A rich king sits on a stone bench. He has four large coins. One coin he holds convulsively at his heart. The sky and the earth are gray. The king experiences his world as gray. He is not satisfied with himself and his life. His problem is that he doesn´t know how to get contentment. He doesn´t know how to live happily. The Greek philosopher Epicurus taught, that we have to limit our worldly desires, if we do not want to become its victims. We should define our point of enough. We should think about how much for us is necessary on external things. We should give it to us. And then we should find contentment and let no other external desires arise in us. When they arise, we should overcome by positive thinking. Oracle = Nothing is taken for granted in the universe. Nothing really belongs to you. It is the right of life to take away everything at any time. Be content with what you have. There once was a Sufi Master who gave his students an apple with a bad spot and said, "This is the apple of paradise." The students focused on the bad spot and were dissatisfied. The master saw the whole apple and lived in paradise (in God). Limit your worldly desires. Find your point of enough. Today is a day of satisfaction. Be happy. Everything is good as it is. 41. Five of Coins. Two poor people go through the snow. The woman is barefoot. She has no shoes. The man is hobbling and supported by crutches. Both suffer from the life. But the man in the blue cloak wears a bell around his neck. He is a man of knowledge. He knows the way of inner happiness. Him makes the external cold not much, because he is warm inside. With his knowledge, he can also help the woman. In the black night appears a shining church window with five gold coins. The world needs the five values ​​of wisdom, compassion, love, peace and happiness. Only through positive values, the inner and outer poverty of the people in the world can be overcome. The task of the wise is to share his wisdom with his fellow men. Oracle = Today helps you the way of compassion. It frees you from the attachment to your suffering. It opens your heart and heals yourself emotionally. Think more of others than to yourself. Concentrate more on the suffering of your fellow man than to your own suffering. Wish that all people in the world are happy. Live for this goal. A poor man helps another. So both get into the light. If you just look at the world around you, then you know where your help is needed. Forward. Success on the path of compassion and universal love. For people in relationships this card means that they should form a team of happiness. If both work together positively, they can get a happy relationship. They should accept the suffering in their lifes and focus on the development of inner happiness. 42. Six of Coins. A merchant gives two poor people some of his wealth. He is standing and the poor are sitting. He can act and they not. The poor can not help themselves. They can not rescue themselves from poverty. They need the help of the merchant. Only the merchant has the potential to which the poor can be saved. Around him are six gold coins like a halo. The merchant gives the poor with his right hand. In his left hand he holds a scale. He gives every poor exactly what he needs. One poor has a green and the other a blue cape. The green poor needs love and hope. The blue poor needs strength and self-discipline. Oracle = Giving is today your way to happiness. Recognize that you are rich. Share your wealth with the suffering world. Help the poor. Help spiritual and material. What possibilities do you have to do good? What is your deed of love today? It makes you happy when you give what to whom? Success. Move a hand in blessing and think, "I send light to (name). May all people be happy. May the world be happy." 43. Seven of Coins. A man stands in front of a green vine. Everything grows well. The fruits are not yet discernible. The wine growers has to wait. He puts his chin on the handle of his hoe. The farmer can only let life take its course. Everything else now depends on the sun, on the right moisture and ultimately on the fate. The cosmos is the master of the fate and not the farmer. The dress and the shoes of the farmer are green. He is full of hope and optimism. A yogi can make each day just his physical and mental exercises. He can not force the harvest. Enlightenment comes of the grace of the cosmos. The seven coins refer to the seven main chakras of a human being. When the seven chakras are released from their tensions, the energy rises up in the kundalini energy channel. The yogi then feels internally happy like a vine full of grapes. When the energy reaches the crown chakra, the mind of the yogi unites with God. He wakes up in a life in the light. Oracle = Come to rest after the hard work. Relax. Hand over the results to God (to life). Everything evolves by itself. Be content with yourself. Everything is fine as it is. 44. Eight of Coins. A craftsman sits on a wooden bench and worked diligently eight gold coins. In his hands he holds a hammer and a chisel. With the chisel he imprints to the gold coins the drawing of stars. The craftsman works for a happy world. He is a Bodhisattva (Karma Yogi). He works not for his ego, but for the happiness of all people. He works for the enlightment of his fellow men and thereby gets enlightenment himself (six chakras on the tree of enlightenment, one is in work and one is for the world). So he tranforms himself by working for a happy world into a life in the light. He is wearing a dress made ​​of four colors. He is successful with the qualities wisdom, love, self-discipline and optimism (hope). Oracle = Diligently working forward. Steady patience with achievement kept in mind. Get yourself into the light. Realize your inner happiness and lead your people into to the light. Connect yourself every day with the enlightened Masters (God), listen to your inner voice (feeling of correctness) and find your way to a fulfilled life. "My goals are ... My way to success is ..." The light is with you. Ahead with self-discipline and perseverance. Success. 45. Nine of Coins. The Mistress of mind stays in front of us in an orange dress decorated with flowers. She holds a tamed falcon on her left fist. The falcon is her own spirit. She controls her thoughts. She masters her mind and her life. Right and left are growing two trees. The land ist green and the sky around her head is yellow. The mistress of mind has activated her Kundalini energy (the right and left Kundalini channel) and lives in the light (in peace, love and happiness). With her right hand she touches nine golden coins, which lie on the ground. She is surrounded by mature vines. The golden coins and the vines symbolizes enlightenment, inner happiness, a successful life. She carries on her head a red cap. She goes the way of all-embracing love and lives as a Karma Yogini (Bodhisattva) for the goal of a happy world. A small snail at her feet says slowly with small steps forward. The mastery of the mind is a long way. Oracle = What spiritual practices help you (yoga, meditation, walking, positive thinking)? What is your problem? How can you solve it? Work on your thoughts. Be a Mistress of your mind. "My way of a succesful life is ..." Slowly forward. Success. 46. Ten of Coins. The old master with white hair sits inconspicuously in an archway at the entrance of the city (the world of wordly people). He wears a coat of red grapes (inner happiness) and magical characters (spiritual knowledge). Ten coins form a picture of the enlightenment tree. The old master is enlightened. He lives in God (unity consciousness), in rest (inner peace) and in happiness. Before the master we see two white dogs (his spiritual disciples). He helps his people, but he lives in another dimension. He keeps himself secluded from the world of addiction energies and can thus keep his enlightenment energy. Oracle = Stay in the background. Remain unobtrusively. Do not get caught up in the struggles of the worldly people. Help them as a secret Master. Mainly help the people who want your help. Help through the power of your arguments and not through negative emotions. Occur not as a Master, but as a friend of all beings. Go the way of all-embracing love. Appear small and friendly. Behave unobtrusive and modest. Then you win. 47. Page of Coins. A young man in a green dress (hope) with a red hat (love) holds a large gold coin in front of his face. He looks at his richness, his potential, his way of happiness. He reflects on himself and his goals in his life. He creates a positive vision (concept) of himself. He wants to be a Buddha, a Goddess, an Enlightened. The sky is yellow (optimism). The land is green (growth). And at the horizont we see the blue mountain of enlightenment. Oracle = Self-reflection. Take you as you are. The spiritual path always starts at the point where you are right now. Accept you with your faults and weaknesses. You may be small. You may be sad and afraid. You may have flaws. Even a small can win spiritually when he connects himself with the enlightened Masters and consistently follows the voice of his inner wisdom. What we lack in spiritual forces, we get it from the enlightened Masters. They give us the energy we need for spiritual victory. Think the mantra, "Om all enlightened Masters. Om inner wisdom. Please guide and help me on my way." Think about yourself and your richness (potential, skills, goals). What do you want in your life? What are your wishes? What are your goals? What is your way of wisdom, love and happiness? Optimism. The light is with you. Success. 48. Knight of Coins. A knight sits on a black horse. Next to him is a brown field. The field must be cultivated. The knight holds a golden coin in his hands. He got the seed of happiness. He has to plant it. Then the field will bring a good harvest, the harvest of a fulfilled life (enlightenment, happiness). The helmet of the knight is decorated with oak leaves, as is the forehead of the horse. The Knight is a winner. He has the necessary skills to win (knowledge, self-discipline, love of the target). To achieve his goals, the knight must bring a sacrifice. He must give up something in order to win. The horse is black. Black is the color of mourning, the resolving of the ego and the entry into the cosmic consciousness. The knight has to go through the darkness to get into the light. The sky is yellow. Optimism. The light (God, the enlightened Masters) is with him. Oracle = Do your job. Work on your field. Set plants of happiness, remove all weeds, care every day for your inner growth, live in love, do good and harvest a life of happiness. You got a great treasure. You know the path of a happy life. Forward with wisdom and endurance. What is your necessary sacrifice to reach your goals? "My goal is... My sacrifice is.. My way of victory is..." Optimism. Success. 49. Queen of Coins. The Queen of Coins sits on her throne in a happy world with many flowers. She is clothed with a red dress. She lives in the all-embracing love. At her feet plays a little rabbit. In the background shines the blue mountain of enlightenment. The Queen is focused on the gold coin in her lap. She lives in God, in the essentials. She exercises to recognize herself as a Goddess (Enlightened) and her world as a paradise. Thus she awakes her Kundalini energy, gets a paradise feeling of the world around her and becomes inwardly happy. Oracle = Today be gentle with yourself and your fellow people. Concentrate on the positive in your life and your world. Be happy with what you have. Count to five positive things, "Positive in my life is ..." What thought makes you feel your world as a paradise? "My paradise thought is ... (I live in the essentials. I have all what I need to be happy. Everything is fine.)" 50. King of Coins. The King of Spirituality sits happy on his throne. He holds a big golden coin in one hand (he owns the big treasure of enlightenment) and in the other hand a scepter with a crystal ball (living in God, in a unity consciousness). He wears a coat with painted red grapes and is surrounded by ripe wine grapes. The king has reached his goal. He lives in the light. Four bull pictures on his throne show that he has overcome his ego and succeeded with great self-discipline. On his head he wears the crown of a Master of Spirituality. He is a Buddha, a Siva, a Jesus, a Socrates. He is a ruler in the land of light and lives in the all-embracing love to his people. Oracle = What is your spiritual role model? Buddha, Siva, Jesus, Socrates, the Goddess, to be a Master of Life? Find your role model, meditate on it, awaken your Kundalini energy und thus stay every day on your spiritual path. Then you will one day realize your role model by yourself. Find an inspiring picture of your role model in the internet (Google) and copy it into your computer. Connect with its energy, identify with it and get his spiritual power. Feel how his engergy flows in you by thinking the mantra, "My goal is... My role model is..." Be a winner in your life. Today is a blessing day. The enlightened Masters are with you. 51. Ace of Cups. From a cloud in the sky a hand appears, offering us a golden chalice (the Holy Grail). A white dove (the Holy Spirit) comes from heaven and filles us with spiritual energy. From the cup flow five energy streams in a big pond full of lotus flowers. God (the life) makes us the gift of spiritual purification. Life gives us the opportunity to transform into a Buddha / a Goddess (King and Queen of Coins). The dove is holding in its beak a white wafer (Host) with a cross on it. Jesus Christ gave bread (wafer) and wine (in the chalice) on the eve of his crucifixion to his disciples. He transmitted them his enllightenment energy. He enabled them to become a son (daughter) of God like him. The Tarot card symbolizes the baptism (spiritual initiation). After the baptism by John, Jesus meditated forty days in the desert. Then the devil (his ego) disappeared and the angels served him. Jesus could help his fellow man with his enlightenment energy. Oracle = Day of blessing. Initiation. Great transformation. Something changes your life. You go through an inner cleansing process. You get spiritual knowledge or spiritual energy. The chakras are opened and the Kundalini energy starts to flow. Go your way into the light. There might be some difficult energy processes in your body or in your mind. Go through it. Think of the grace. One day you will realize great happiness and a life in the light. 52. Two of Cups. A man and a woman with a laurel wreath on their heads give each other a chalice with healing energy. To win, we must connect our female and male energies. We succeed with wisdom, love, self-discipline and much rest. Above the man and the woman raises a healing wand with two snakes and a winged lion's head. With the energy of the lion and the wisdom of the snakes we will reach our goal. The land is green and the sky is bright blue. Ahead with optimism. Oracle = Healing. Success through the combination of female and male energy. Succeed with wisdom, love, self-discipline and much rest. Live by the five principles of health (healthy diet, regular exercise, plenty of relaxation, positive thinking, avoidance of stress). Build enough exercises every day in your life so that you resolve your internal tensions. What is your suffering? What is your way of healing? "Om all enlightened Masters. Om inner wisdom. Please guide and help me on my way." Follow consistently your inner voice of wisdom. Forward with a wise daily schedule of healing. Heal yourself. Success. 53. Three of Cups. Three women are toasting each other with their cups. One woman is wearing a white dress, the second a red and the third an orange. The woman with the orange dress maintains in her left hand blue grapes. The main route to the great victory is the Trimurti Yoga, the yoga of the threeness. Trimurti Yoga is the wise combination of payer (connecting with the enlightened Masters or with God, Bhakti Yoga), all-embracing love (doing good, Karma Yoga) and spiritual practice (meditation and mental work, Jnana Yoga). Anyone who connects himself regularly with the enlightened Masters (praying, reading, oracle, meditation) will be led to the great victory on the spiritual path. Who makes every day some spiritual exercises (yoga, walking, meditating, reading) resolves his inner tensions and grows into the light (in his inner happiness). Those who work for a better world come into a cosmic consciousness and thereby get enlightenment. The white woman walks the way of wisdom (Jnana Yoga). The red woman lives in the all-embracing love. And the orange woman holding the ripe wine grapes practices Bhakti Yogi. Together they got a great victory. They received a great harvest for their work. On the ground we see many fruits. Oracle = A great success. A great victory. Rejoice. Make yourself aware of your success. What did you work for? What have you harvested? Celebrate your success. Think: "My success is ... My victory is ... I am thankful for ..." Forward with joy. Rejoice your day of victory. "My act of joy today is ...."
54. Four of Cups. A young man sits propped against a tree. He thinks about the sense of life. He seeks his path in life. From the blue sky a hand appears out of a cloud and gives him a cup (an idea). Three golden chalices stand already before the man. What do the four cups? After the system of the Tarot, the four cups are symbols how to come into the paradise (into a life of happiness). The three cups in front of the man contain the qualities of wisdom (eagle, mind work), self-discipline (lion, exercises), and ego-sacrificing (taurus, take things as they are). The fourth cup is filled with love and joy. All four qualities together are able to awaken the energy of happiness. They can bring the tree of enlightenment to grow. The first three qualities are necessary to be successfull on the path of inner happiness. But without love and joy the way is hard to go. The young man must bring more love and joy into his life to come from sadness to happiness. Oracle = Go your spiritual way with enough joy. What makes your mind positive? Activate your Kundalini energy with spiritual exercises (yoga, walking, meditation, reading, positive thinking). Look for a positive purpose in your life. Have enough fun every day. "The sense of life is... The positive task in my life is.... My deed of joy is..." Come from sadness to happiness. Forward. Success. 55. Five of Cups. A man in a black cloak stands with his head down, looking to three fallen chalices from which the liquid has leaked. The sky is grey. The man has suffered a great loss in his life. He is sad. He lives in a world of suffering. Behind the man are standing two more chalices. They are filled. They help him to walk over the white bridge in the background into the land of light. In the middle of the paradise we see the castle of God. If we live in the essentials, we can transform our mind into happiness. The task of the man it is to cross the blue river and to reach the land of light. How can the man come from the land of suffering into the land of light? Only our inner tensions hinder our enlightenment. If we resolve the tensions with our spiritual exercises, our inner happiness awakes. We must only practice the exercises long enough and effectively. Tensions can sit in the body and in the mind. We need exercises for the body (walking, yoga, meditation) and exercises for the mind (reading, positive thinking). The main route into the light is today the activity. Oracle = You had a big loss in your life. What is your loss? Think several times: "I'm sad because ..." Live your grief. Grief is a way of inner cleansing, of letting go. Go through the grief into the light. Make as long your spiritual exercises (yoga, reading, walking, meditation) until you are in the light (in a positive state of mind). Realize the Sat-Chid-Ananda (being-unity consciousness-happiness). Bring much joy (enjoyment, lovely things) in your life. Forward with optimism. Success. 56. Six of Cups. A young boy gives lovingly a little girl a golden chalice with a white star flower. He shows his girlfriend how she can successfully practice the spiritual path. He makes her the great gift of wisdom. He gives her the knowledge of the path of inner happiness. The girl is wearing a white glove. She is willing to take the spiritual knowledge. She is ready for spiritual truth. She is willing to go the spiritual path successfully. Oracle = Success on the spiritual path. Ahead with peace, joy and optimism. What is your act of love today? If you are the giver, stay small and modest. Do not give to strengthen your ego, but to strengthen the happiness in the world. If you are the taker, be thankful for the gift. Students and masters are blessed from God. Celebrate the day. Today is a day of a great gift. 57. Seven of Cups. A visionary (black figure) sees seven golden chalices, which appear in a cloud in the sky. The center chalice contains the higher self (a person in a white triangle). A golden snake symbolizes inner healing. A head stands for a positive vision of oneself. The castle means a life in the essentials (in God). The great treasure in the life on earth is the way to enlightenment. To get permanent inner happiness we have to overcome our ego (the blue dragon). To win on our spiritual path (laurel wreath) we need endurance. The first step to victory is to create a positive vision. The second step is to find the path to realize our goals. The third step is to go the way until we have reached our goals. Oracle = Get clarity. Create a clear vision of your life. What do you want to achieve in your life? What are your goals? What is your idea of ​​a happy life? What visions appear in your mind? Those who have positive visions, also have the power to live positively. "My goals are ... My positive vision is ..." Realize your dream of a happy life. Stay on your track. Go consistently your way of wisdom and hope. Forward. Success. 58. Eight of Cups. A man in a red coat is walking with a large stick through a landscape full of shoals and rocks. The moon has moved in front of the sun. The man finds the right way, because he follows his inner wisdom (intuition) . The red coat means that he goes the way of all-embracing love. He sees the suffering of others and helps them within his means. The path is difficult to find because it is dark. The man felt his way with his stick. He looks exactly at his situation. He listens carefully at his inner voice of wisdom. He avoids the water holes, goes his way flexible forward and reaches his goal. Oracle = The situation is difficult. Go slowly forward with a good feeling for the right way. Hear at your inner wisdom. Feel in each moment what you need and what is your path of victory. Look exactly at your situation and find flexible your way. Optimism. Success. 59. Nine of Cups. A contented man sits with arms crossed on a bench. He has spent force and effort to get to his current success. The man got a great triumph. The success is characterized by nine golden chalices on the blue podium behind him. Now the man lives on a winning level. His green shoes indicate that he may go his way forward with optimism. The fortune will be with him. Everything is good and will getting better and better. Oracle = Completion. The good thing is done. You have won. High level of satisfaction. Now you are allowed to relax and to enjoy your life. Be happy about your success. Celebrate your victory. Dedicate your victory to all beings. "I dedicate my success to the happiness of all beings. May all people be happy. May the world be happy." 60. Ten of Cups. On the blue sky appears a rainbow with ten golden chalices. The people in the green country under the rainbow are happy. The children dance. A man and a woman are jubilating. They look to the rainbow in the sky. The rainbow is a symbol of fortune. It points to great internal or external happiness. The rainbow is a semi-circle of light. If we extend the rainbow, we get a circle. Enlightenment can be well represented by a circle. The circle symbolizes the cosmos, wholeness, inner harmony. The enlightened is in harmony with himself and his world. Enlightenment comes always by grace. We can only do what we can, but the Holy Spirit (the light of God) comes into us by his own. We have no claim on luck in our life, but life can bless us if it wants. Oracle = Great grace. Great happiness. Day of blessing. Something very happy has happened or will happen. Which happy event has happened in your life? What has come to completion? What are you thankful for today? If you start something, this card show you a great success. Celebrate the day. The heaven has blessed you with great fortune. 61. Page of Cups. A young man with a blue hat (intuition) stands on the shore of the sea (in front of his own subconscious). He holds a chalice with a fish in his right hand. The man speaks with the fish. He asks him for advice, for guidance and help along the way. The fish is his inner voice of wisdom. The inner wisdom is a combination of clear thinking and inner feeling. If we think clearly about a problem and explore our feelings, we find our personal best way of life. Who is good in touch with himself finds his path to spiritual self-realization. We can consider our inner voice as the voice of God (the enlightened Master) in ourselves. In a higher dimension the enlightened Masters are connected with us through the energy of truth. They can lead us through our inner voice of wisdom into a life in the light. All we have to do is to follow consistent our personal way of wisdom (rightness). The knave of Cups is wearing a blue dress with white and red lilies on it. He goes the path of inner purification (white flowers) and the path of universal love (red flowers). He is good in touch with his inner voice (the fish in the chalice). Thus he will be a winner in his life. Oracle = Consider carefully your inner and outer situation. What are your goals? What is your path of wisdom? Listen to your inner voice. Connect yourself with the enlightened energies (with God). "Om all enlightened Masters. Om inner wisdom. Please guide and help me on my way." Forward with a good inner feeling, wisdom and endurance. Optimism. Success. 62. Knight of Cups. A knight on a white horse (power, inner purification) passes the great river from the land of suffering to the land of light. He follows his inner voice of wisdom and succeeds. In his right hand he holds a big golden chalice. The chalice represents his wisdom. It is the Holy Grail. Anyone who follows his inner voice of wisdom finds the path of spiritual self-realization. He can turn his hardened (iron) soul into a golden soul full of happiness and light. The knight (spiritual hero) wears the insignia of the God Hermes (winged helmet and winged sandals). He is a Bodhisattva. He brings the people the message of the way of love, peace and happiness. Oracle = Overcome all difficulties creatively. Stay on your track. Listen to your inner voice of wisdom. What are your goals? What is your way of wisdom. "Om all enlightened Masters. Om inner wisdom. Please guide and help me on my way." Think about, "My way of wisdom is... Unwisdom is ..." Forward with wisdom, creativity and endurance. The power ist with you. Success. 63. Queen of Cups. On the beach of the sea sits in a white dress (inner purification) with a golden crown, the Queen of Cups. The stone throne (self-discipline) is decorated with mermaids (a good inner sense). The Queen concentrates at the ornate chalice with a cross on top in her hands. Two angels on the left and right side pray to the chalice. The ornate chalice is the Holy Grail. It represents the holy life in God. It represents a life in happiness, holiness and love. It shows us the goal of enlightenment. The way to reach this goal is not easy to find and to go. We need a clear thinking, a good feeling and much self-discipline. By the grace of God we will succeed. This Tarot Card shows, that the grace is with us. We hold the Holy Grail in our hands. We can find our way into a life of happiness. We only have to go our spiritual path with wisdom and endurance. The Queen of Cups is in a good contact with herself. She ist a Mistress of spirituality. She finds creatively her way to her goal. Oracle = Focus on your goal and flow creatively through all difficulties. Save yourself with your spiritual exercises. Practice at the right time meditation, walking (sports), reading, doing good and enjoying the life. Be a master of an effective happiness practicing. With a good inner feeling you find your way into the light. Forward with endurance. Success. 64. King of Cups. In the midst of the wild sea of life sits the King of Cups on his throne of stone (serenity). He is buffeted by raging storms. The clothing of the king is blue (inner peace). His cloak is orange (love) with a red border (power). Around his neck he wears a necklace with a gold fish. He is the king of wisdom and good inner feeling. In his right hand he holds a golden chalice (wisdom) and in the left hand a golden scepter (power). He sticks to his wisdom and rules with power himself and his world. Ultimately, the King of Cups represents an enlightened master who can retain his enlightenment even in difficult situations. In Tibetan Buddhism he is called a Master of Mahamudra. In Yoga we speak of a Siddha, a master of the spiritual energies. As a symbol of this, there is the dancing Shiva (Nataraja), who sacrifices his ego (under his feet), lives in the unity of the cosmos (in a circle of light) and holds himself with the five elements (arms, legs and head) in internal equilibrium. Thus he can dance with the life und always keep his happiness. Oracle = You are a Master of Dance with life. You stay even in the greatest external chaos internally stable. With the five elements of serenity, self-discipline, wisdom, love and enjoyment you keep your internal equilibrium. You dance with the difficulties and grow by that into in a life in the light. High praise. 65. Ace of Swords. Out of the gray sky (a situation of suffering) a hand (God) gives you a sword with a golden crown. It is the crown of the spiritual winner. To get enlightenment (happiness, a life in the light) you have to sacrifice your ego. You have to give up something to break through into the light. At the crown are hanging an olive branch and a palm branch. You will succeed. From the golden crown are falling six tears to the ground. The waiver is not easy. But the expected fortune gives you the strength to perform your sacrifice. Oracle = Who wants to achieve a goal has to sacrifice something for it. He must give up something (companionship, pleasure) and has to invest something (effort, work, self discipline). An athlete trains every day to win the competition. A worker is working every day hard to obtain external wealth. A yogi exercises every day consistent to get enlightenment. The cosmos makes you today the great gift of success. He blesses your path of sacrifice. You'll achieve your goal. If you now make the necessary sacrifice for your goal, you will get a large external or internal win. What sacrifice is necessary to achieve your goal? "My goal is ... The necessary sacrifice (waiver) is ..." What do you need, so that you can go your way positively? Give it to you. Forward. Get the victor crown. You will one day be a king of happiness. Success. 66. Two of Swords. On a gray beach in the dark night a woman in a white dress is sitting on a stone bench. Her eyes are bandaged. Her arms are crossed protectively in front of the heart chakra. Behind the white woman is the sea of her subconsciousness with some rocks and the land of paradise (happiness) in the background. To find her way, she must carefully explore her subconsciousness. She must feel exactly what blocks her inner happiness. What wrong desires, attachments and fears are in her. A half moon shines on the sky above her. She will find her way to her goal (happiness) with a good inner sense (intuition). In her hands she holds two swords, which show like two large sensors to the left and right top in the sky. The swords are her feelers on the way to happiness. The two swords to resolve inner tensions are wisdom (a clear mind, clear thinking) and a good feeling for oneself. Oracle = Follow your truth (reason) and your inner feeling (intuition). When reason and inner feeling work together well, they can bring you to happiness. Inner happiness is created by the resolution of the tensions in the body and in the mind. What exercises dissolve your inner tensions and bring you into happiness? Physical (walking, yoga, sports, meditation) and spiritual exercises (reading, mental work, all-embracing love, positive sentences) are required. Explore yourself, find out what you need, live on a wise spiritual schedule and organize your day well. The path in the moment is hard to see. Stay on your track. Go slowly forward. Feel what is right in each moment. Success. 67. Three of Swords. The sky is grey. Sorrows. It's raining. Grief. A big red heart is pierced by three swords. Pain. Go into the nothingness, sacrifice your ego, accept your fate and transform into fullness. By killing your ego with the three swords of wisdom, spiritual exercises and all-embracing love you can get to happiness. Live as a spiritual practitioner, as a helper of all beings and in God (being-unity consciousness-bliss). There is a way to overcome all suffering. This is the path of enlightenment. Walk consistently the way of inner happiness and reach a higher level of life. At this level you integrate all grief and stay anyhow in the light, because the happiness comes from inside (from God). Oracle = There is suffering in your life. You can overcome the suffering. Sacrífice your ego by doing your spiritual practices (meditation, reading, walking, doing good, enjoying the life). Accept all the suffering, bring enough spiritual exercises in your life and live primary for the happiness of your fellow man. Flow positive with life. Forward with wisdom, self-discipline and optimism. Succeed in five steps. The emotions: What are the feelings it in you? Fear, anger, addiction / desire, grief. What feeling is strongest? Where is the feeling sitting in your body? Thinking: Think about your problem for so long, until you find a solution. Collect all the information you need. Think about different solutions. What is the way out of your problem? What triggers your problem? Implementation: Succeed. Fulfill your positive life plan. Avoid meaningless brooding. Now is the time to realize powerful. Go your way to victory. "My positive thought is ....(I will win. I will get happiness. Forward.)" 68. Four of Swords. A dead knight lies in a grave chamber on a brown coffin. Above him hang on the wall three swords. A fourth sword is beside the coffin. The knight (spiritual hero) has his hands folded in front of the heart chakra. He prays to God (the enlightened Masters) and God will help him. In a stained glass window in the upper left corner of the Tarot Card we see the resurrected Christ, who blesses a kneeling disciple. The way to come from suffering to happiness show the four swords. They point to the head (wisdom), the heart (love), the solar plexus (power) and the whole body of the knight (ego sacrificing). Oracle = Take the suffering in your life. Let your false desires going on. Pray: "Om all enlightened Masters. Om inner wisdom. Please guide and help me on my way." Come to resurrection. Stand up. Free yourself. What is your problem? What solves your problem. Go consistently your way of wisdom, love and happiness. Make your spiritual exercises (meditation, walking, reading, mind work). Live in the all-embracing love and find your way of doing good. Go ahead on a middle path. Bring enough enjoyment into your life. Forward with self-discipline. Success. 69. Five of Swords. Storm clouds move across the sky. A difficult situation. External or internal chaos. But you will win, if you go forward cleverly. A smiling man carries the two swords of his enemies on his shoulder. He has defeated his enemies. The enemies go away sad. In his right hand the winner holds his own sword, and on the ground lie two other swords. All in all the man has five swords. The number five points to the five elements of the Tarot. The man succeeded with the five qualities wisdom, power, serinity, love and joy. He is a Master of the five elements. The way to win is firstly to recognize clearly the internal and external opponents. If we see them clearly, we find their weaknesses and can overcome them with a clever strategy. Oracle = You are a winner on your problems. What are your goals? Look exactly at your situation. Where are the difficulties? What is the way to go through? What is your (inner or outer) enemy? How can you overcome him? Be creativ. Be clever. What is your way of victory? Think: "My opponent is ... My way to win is ..." Forward with optimism. You will succeed. 70. Six of Swords. A boatman takes his family (a wife and a child) with himself on his way across the great river into the land of light. In the boat stick six swords. Working as a spiritual ferryman is a way to sacrifice the ego, to live in the all-embracing love and to attain enlightenment. Many spiritual people have lost themselves on the way of helping. If a not enlightened man wants to work as a spiritual teacher (priest, yoga teacher, psychotherapist, life coach), he must be aware of the ego traps and able to control his negative qualities. After any contact with his unenlightened fellow men he must spiritually cleanse his mind. Who is not fully enlightened and works as a spiritual teacher has to be aware of his actions. He should focus on his own practicing, connect every day with the enlightened Masters and check himself on pride, greed, attachment, careerism, and sexual lack of clarity. A real spiritual Master is more a beggar than a Buddha. He is anchored in the egolessness and not in the idea to be ​​a great enlightened. He is more a servant of his fellow men as their king. He lives in being and giving and not in wanting to be admired. Oracle = Working as a spiritual ferryman gives you the strength to bring yourself to enlightenment. Help your fellow man. Rescue spiritually your family, your children and all people associated with you. Give them the great knowledge of inner happiness and the path of all-embracing love. Keep yourself small. Stay humble, modest and as a servant of all. Connect yourself every day with the enlightened Masters (God). The enlightened Master will lead and protect you. "Om all enlightened Masters. Om inner wisdom. Please guide and help me on my way." Success. 71. Seven of Swords. A man with a red hat (love) sneaks up on tiptoe, with five swords in the arm from a tent camp. He robs his opponents their power. He is very clever and careful. The sky is yellow. Optimism. The man wins on his way. Two swords stuck behind him in the ground. The man is good earthened. He holds himself small and unobtrusively. Therefore his opponents underestimated him. They slep and he uses the situation to succeed. In Norse mythology there is the figure of Loki. Loki the sly knows how to help in any situation. He is a cunning fox. He can always think of something. He is clever, creative, flexible, and usually at the end victorious. Oracle = The clever spiritual master. Do good. Help your fellow man on the spiritual path. Connect love and wisdom. Then you succeed. The situation is difficult. The enemy is strong. Consider the conditions. Recognize your opportunities. Be aware of your personal strengths and weaknesses. What is your goal? In what way can you reach it? "My situation is ... My way to victory is..." Flow clever, creative and flexible with the circumstances and you will win. Forward with optimism. Success. 72. Eight of Swords. A woman blindfolded and with arms shackled goes her way through a country full of water holes. The sky is gray. The situation is difficult. The woman can feel the right path only with her feet. She can only go forward slowly. Around the woman stuck eight swords in the ground. The number eight points to the path of love (karma yoga). In the background we see a white castle on a hill. The white castle is the goal of enlightenment. Who is innerly purified lives in God (the cosmos) as in a castle. Nothing outwardly can destroy his inner peace and happiness. The woman wants to get enlightenment through the path of all-embracing love. She wants to destroy her ego by doing good to all. The way of embracing love is hard to go. There are many traps lurking along the way. If a person works too little for the goal of a happy world, this dissolves not his ego. He does not get into a cosmic consciousness and developes no inner happiness. If a man works too hard for his fellow people and cares too little for himself, he loses his enlightenment energy. A Karma-Yogi must therefore live in the right balance of external work, sufficient rest, and spiritual practice. Ideally, he should work out from the rest (God) for a happy world. Oracle = The situation is difficult. The path is hard to see. Look carefully at your situation, your fellow man and your personal options. Success through a sensitive feeling for the right way. Go forward step by step. Thus you will reach your goals. "The right way in the moment is... Now I do best ..." Success. 73. Nine of Swords. Nine swords lie horizontally on a black wall. Great sacrifice of the ego. A woman in a white nightgown sits weeping on her bed. She holds her hands over her face. Great mourning. On the bed frame we see a picture of standing man who kills a seated man with a spear. The seated man symbolizes the sad woman. Something has killed the ego of the woman. She has to let go her false wishes. Mourning is helpfull for that. On the legs of the woman lies a beautiful blanket with red roses. If the woman takes her hands from her face, she can see the beauty in her life. The way to overcome her grief is love (red roses) and spiritual practice (blue drawings). Oracle = After the crisis. Overcome your grief. Let your sorrows go. Think about your positive goals. Get up, be active and succeed in your life. What is your way of a successful life? What are your goals? "My goals are... My way to win is... " Success. Optimism. Go forward to happiness. Enjoy the day. Do something you like. 74. Ten of Swords. On the ground lies a dead man. He is covered by a blood-red cloth. Ten swords stuck in his back. The sky is black. Ten is the number of God. The man gave up his ego. He has let go of his worldly desires. He has accepted the suffering in his life. He has sacrificed himself in his spiritual path. He expects only happiness from himself, from his spiritual exercises, from a life in God (inner happiness). The outer world is dead to him. He recognized his wordly desires as an illusion, as a false dream. Some life in him is still there. His white left arm shows at us. His hand formes a mudra (energy awakening through spiritual exercises). Under the yellow horizon we see the big river and the land of light. We have to stand up, to cross the river and to awaken our inner happiness. We can be happy amidst all the chaos of life. We only need to let our attachment to the world go and to live in enough rest, enough spiritual practicing and in the all-embracing love (doing good to all, working for a happy world). Then our body will be filled with enlightened energy, and we feel strength, love, peace and happiness in us. Oracle = The path over the great river into the land of light runs through the death of the ego. Let your false wishes go. Take the things how they are. Stand up and go into the land of light. Make your spiritual exercises (yoga, meditation, reading, walking, doing good). Forward with strength. Success. 75. Page of Swords. On a hill stands a young man and swings his sword. He goes his way with self-confidence. The blue sky shows some clouds. He has to fight a little bit. But the problems are small and the page can do it well. The sword refers us to the path of sacrifice. The young man must cut his worldly attachments. He has to concentrate on his spiritual goals, and focus himself on his spiritual path. Above the head of the young swordsman are flying ten black birds. Ten is the number of God. Black is the color of ego sacrificing. To come into a life in the light, the young man has to go through the darkness. The boots of the young man are red (power), the pants are green (hope), the vest is brown (serenity), the collar is white (wisdom) and the sleeves are yellow (happiness). The young man will succeed on his way into the light. Oracle = Look at you as a winner and you will conquer. What are your goals? What is your path? Think: "My goal is... My way of victory is..." Trust in your own power. If you trust yourself and go consistently your path of truth, the victory is with you. There are some minor difficulties and problems. Go forward with confidence and firmness. Success. 76. Knight of Swords. Chaos in the world. Stormy clouds. Black trees. The land is parched and needs water. A knight (spiritual hero) in an iron armor (power) with a red cape (love) comes on a white horse and saves the world. He swings his sword. He fights with all his power for a better world. If the world were a village of 100 inhabitants, then one man is super rich. He owns a third of the country and 30% of the village's assets. 20 people have 80% of the total wealth of the village. They have much more than they need. 40 people have enough money. 40 people (40%) are the poor. Half of them are malnourished or starving directly. In their environment, there is no adequate disease prevention, severe addiction problems (drugs, alcohol) and an escalating crime. The external wealth has doubled in the West in the last fifty years. At the same time the number of depression has increased tenfold. The unregulated capitalism leads to large external wealth for a few people and hunger and unhappiness for ever more people. Capitalist globalization will bring a few super-rich, a little wealth for a small middle class and a massive impoverishment of a large underclass. It creates huge slums, crime and a lot of substance abuse problems. If we do the capitalist globalization with no wisdom, we will destroy the environment, poverty will become uncontrollably large and the unhappiness will grow. There will be many senseless wars. We need a globalization of love, wisdom and peace. The world community should be centered in the principles of universal love, world peace, happiness for all, enough work for all, enough food for all and adequate health care for all. A world savior works within his means for a happy world. Humanity is one family. In a good family, all family members contribute to the success of the entire family. May we understand this, accept our social responsibility and act powerful. Oracle = Forward. Look at the misery of the world. Don´t look away. There are always people who need help (the poor, elderly, sick, lonely). There is always something that we just can do. Anyone can send light to his fellow man every day. Anyone can participate in a charity. Anyone can donate some money. Anyone can live as a world savior. We can spread the knowledge from the path of wisdom and love on the internet. We can strengsten our fellow people with positiv thinking. We can organize social activities. The internet offers great opportunities to work for a better world. A Bodisattva (Knight of Swords) concentrates on the suffering of the world, awakes his compassion and grows by this to enlightenment. He gets an unity consciousness by working for the poor and suffering people of the world. Work for a world of love, peace and happiness. What can you do? "My way to help is ..." Sacrifice your ego. Overcome your dullness. Forward as a hurrican. The power is with you. Success. 77. Queen of Swords. The Queen of Love sits in a white dress (cleansing exercises) with a golden crown (mistress of wisdom) on a stone throne (self-discipline) in the midst of gray clouds (outer misfortune). She lives in a world of suffering, but her head is clear. Spiritually she lives in a dimension above her outer suffering. The Queen holds a sword like a szepter in her right hand (power) and blesses with her left hand all people with love and wisdom. The sky is blue and a black bird flies over her head (ego sacrificing). The tarot card shows the Queen not frontally but sideways. She takes her fellow man more important then herself. She lives in the center of life as a Bodhisattva (Queen of Love) and thus can rise herself above her own suffering. Oracle = The bad news is: "You live in a field of suffering." What is the suffering in your life? The good news is: "You can still be happy and just because." You can transform your field of suffering into a field of spiritual growth (Buddha field). Your suffering can be your great helper on the way to inner happiness. Without the suffering in your life you'd probably never practice consistently spiritually. The secret of a happy life is that happiness is not primarily an external but an internal matter. If happiness is mainly an internal matter, then we can grow even in outer misfortune to inner happiness. We only have to do enough spiritual exercises (yoga, meditation, walking, reading, mental work). We only have to resolve our internal tensions. Then at some point happiness and enlightenment appears in us. We only need to organize our life so that we grow spiritually. We must develop enough self-discipline. We must live on an effective daily spiritual exercise plan. And we should live in the center of our life as a karma yogi (Bodhisattva, person of all-embracing love). We must take our fellow man more important than ourselves, so that our ego dissolves and we get a unity consciousness. Transform yourself into a Goddess of Happiness. Do your spiritual exercises. Move a hand and send all people light: "I send light to... May all people be happy. May the world be happy." Happiness on the way of spiritual exercises and all-embracing love (doing good to others). Forward. Success. 78. King of Swords. In the land of suffering (black trees, grey clouds) sits the King of Swords on a stone throne (self-discipline) in a blue clothing (inner peace). He has a red cape over his shoulders (love), a crown on his head (wisdom) and a sword in his right hand (ego sacrificing). He has to take things as they are. His left hand lies on his knees. On the middle finger we see the Philosopher´s Stone. The King of Swords is a Master of Life. He owns the knowledge to transform unhappiness into happiness. His secret is the combination of love, wisdom and spiritual exercises. He lives by a consistent spiritual day plan (going, reading, meditating, resting). He practices constistently mental work (overcoming negative thoughts and feelings). On the backwall of his throne is a drawing of the paradise with Adam and Eve, two crescent moons (a symbol for God) and many butterflies. His vision is a happy world full of love, peace and wisdom. His vision is to live in paradise, to transform his world into a paradise. Oracle = Forward on the threefold way of wisdom, love and spiritual exercises. Succeed through consistent mental work (self-reflection, positive thinking), doing good (working for a happy world) and enough daily exercises (yoga, walking, meditation, oracle reading). Give yourself enough rest and enough pleasure. Go with a clever strategy through your day. Transform yourself from unhappiness to happiness. You master your life in a difficult situation. Forward. Success.